As a company with an online presence, there is no shortage of goals worth chasing in an effort to see better results. Website traffic is an obvious example. Companies are constantly investing time and money into boosting the organic traffic they are able to earn from search engines. More and more, there’s another KPI that’s being treated with just as much – and sometimes even greater – priority. 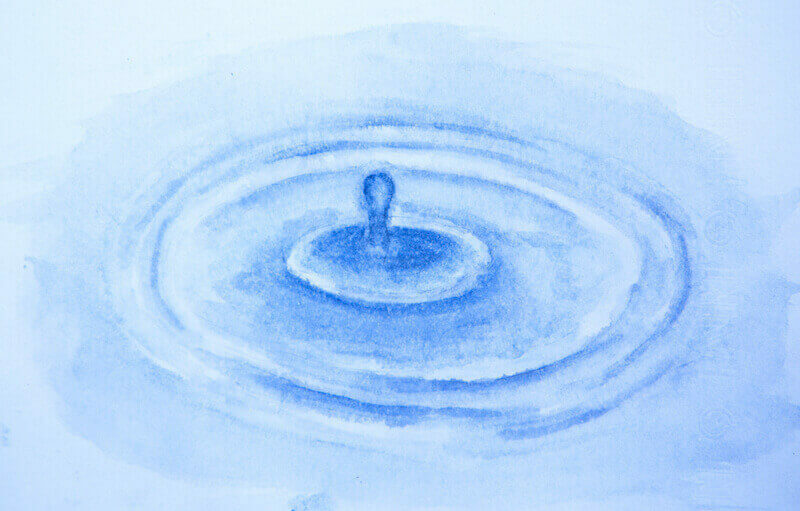 Many marketers realize that one of the best things they can do for a company is to build its influence. Of course, influence isn’t a remotely new concept, but many companies were able to shift their focus in the Digital Age. With so much quantifiable data available about online behavior, it was easy to focus on clicks, traffic, and shares. The pendulum is swinging back. In recent years, many companies that once dominated SERPs (Search Engine Result Pages) have lost business to companies that wield far greater influence over their industries. As Chris Widener explains in The Art of Influence, “Influence is the key to success. Influence is the art of business.” In short, it’s worth becoming influential. So, if you decide to make influence a priority for your company in 2019, here are five signs you’re on the right track. For the most part, doing well on social media means more than just linking to good content. You need to engage in discussions and provide helpful advice, as well. 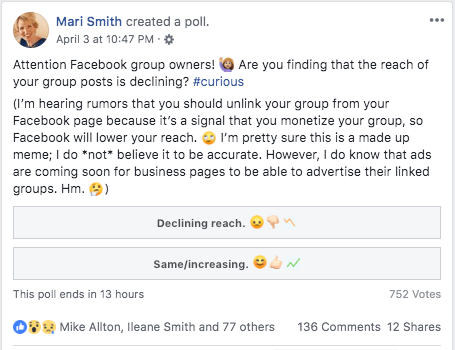 Mari Smith, one of our favorite Facebook experts, is a master of community engagement. The poll below has 752 votes, 136 comments, and 12 shares. But, what really caught our attention was how much Mari joins the conversation with her Facebook Audience. Because of her tremendous knowledge and her willingness to interact with people online and off, Mari commands incredible influence. You’ll know your influence is growing when you receive responses to your social content, but also – and more importantly – when you see your follower-count grow. Increased traffic to your website from your social media accounts is even better still. Don’t forget to keep tabs on how often your company is mentioned, as well. You might not always get tagged, so use a brand-listening tool and compare numbers month-over-month to see if your influence continues to grow. Moving people from passivity to partnership is a lot easier to do when you have their permission to contact them. It’s even easier if they are looking forward to your next newsletter! 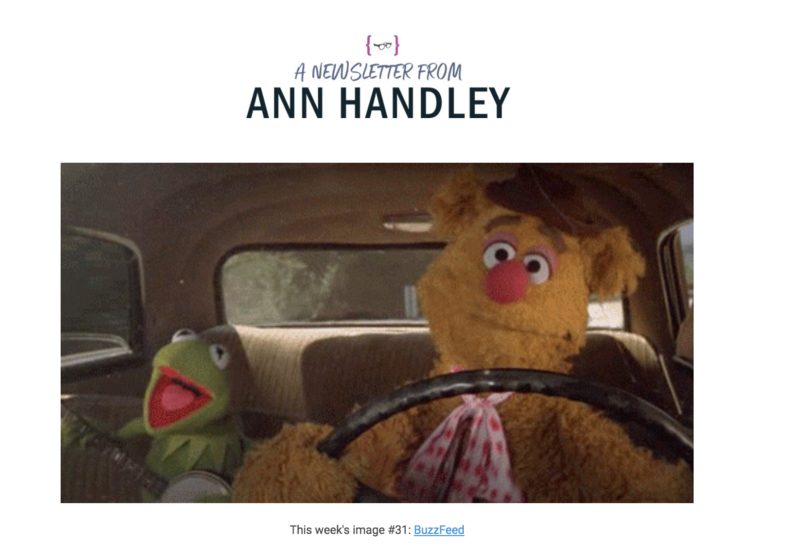 Ann Handley makes this point brilliantly when she describes email inboxes as one of the few digital spaces where humans, not algorithms, control what gets in (and what stays out). If your subscriber list is growing, you have an opportunity to build your business. When it declines, you’re losing ground. When your subscriber list grows, you have more influence; when it declines, you’re losing ground. Similar to the last point, if you’re becoming more influential, you may notice more sites linking to yours. This will precede an uptick in traffic, too, because Google loves backlinks. The reason you’re seeing those links is that companies know that Google appreciates when sites link out to other websites – not just interlink to their own. Google appreciates it even more when the outbound links are to high-quality, authoritative sites. Connections to compelling sites also makes the human-readable content better. A statistic, example, or even just an idea sounds much better when the reader understands it’s coming from an authority. Collaborative content can do wonders for a company, but only if the business pairs with respected brands. That’s why you should take it as a very promising sign if you get approached by another company because they would love your assistance with some new content. It means even your peers are now recognizing the influence you have. Working with a partner on content also expands your resources to cover a topic well. We recently worked with Trust Insights on a piece comparing clicks and social engagement for B2B content. 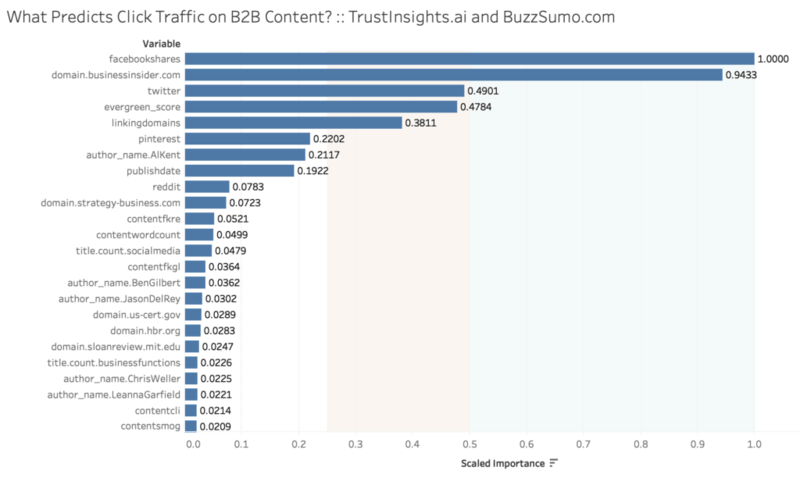 BuzzSumo contributed the engagement data, and Trust Insights contributed the click data. The result is a unique look at successful B2B blogs. Depending on the industry you’re in – especially if you run a personal brand – you may find companies approaching you for help with influencer marketing. This means that they think you’re so influential that simply supporting their products or services online would be enough to boost their sales. That’s proof you’ve become influential. Perhaps the pinnacle of influence is when your company isn’t just participating in conversations and chiming in with your two cents, but when you’re actually able to start and/or lead them. When your company can leverage its expertise to cover topics others don’t or take a unique viewpoint and see shares or traffic as a result, you now have the ability to move your market at will. One example of an unquestioned influencer in the world of online marketing is Brian Dean. He made a name for himself years ago by realizing that backlinks were important, but that the vast majority of marketers were going about getting them the wrong way. It seemed like almost overnight he went from relative-unknown to sought-after master of SEO. Take a look at one of his newest posts, The Definitive Guide to SEO in 2019, and you’ll see he’s still at it. While many in the industry continue focusing on conventional metrics, Dean is emphatically recommending readers prioritize dwell time, a metric that traditionally doesn’t get a lot of attention. Here’s one of the best parts about growing your company’s influence: once you do, its power can last forever. It will take time and work to get there, but once your market sees you as influential, moving people from passivity to partnership will become less and less of a struggle. That’s why you should make it one of your top priorities starting today. The sooner you have influence, the sooner you can begin wielding it for years and years to come. Grow your business’s influence through influencer marketing. Buzzsumo offers tools to let you discover the best content relevant to your niche and the right influencers by location. Try it for free today.